Italy head coach Roberto Mancini has warned his players not to take Liechtenstein lightly in their Euro 2020 qualifier on Tuesday. The Azzurri kicked off their Group J campaign with a 2-0 win over Finland on Saturday and are expected to comfortably cruise past their opponents in Parma, who are ranked 181st in the world and have won just twice in their last 31 games. Mancini, though, has pointed to Brazil's shock 1-1 draw with Panama on Saturday as proof that there are no guaranteed wins in international football. "If we are not alert at the beginning, it can become dangerous," he told a media conference. "Look at the Brazil v Panama game. There are no easy games, and all should be approached with maximum concentration. "A team should approach all matches the same way – it doesn't matter what opponent is front of us." 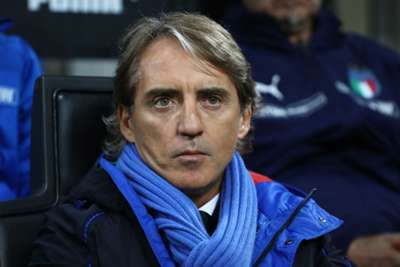 After failing to qualify for the 2018 World Cup in Russia, Mancini is keen to harness a more positive atmosphere surrounding Italy at the start of their Euro 2020 qualifying campaign. Three points against Finland got them off to a fine start, but Mancini knows he has more to do to fully win back supporters. "We are happy because we wanted to bring back enthusiasm," he added. "We could only do it because of the quality of the team. "We have to work hard to improve and to get many more people attached to the national team." After opening his international account against Finland, Juventus striker Moise Kean is expected to once again start up front at the Stadio Ennio Tardini, but Mancini intends to shuffle his pack. "We have not made any decisions yet, but we will probably change three or four players," he said.